"It is 1969, James and Linda Alexander start married life with everything against them; she is pregnant, money is tight and they rent a room and kitchen in Glasgow’s east end. 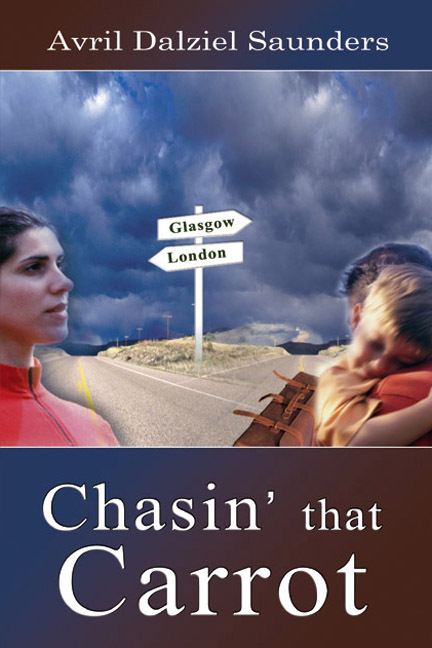 Things are difficult, work is scant in Glasgow and James and Linda have a toddler son with another one on the way, they decide to move down south to ‘Chase that Carrot’. Work is plentiful and wages are good in the London area, but there are no houses for rent. James roughs it in a rented room and Linda stays on in Glasgow. Weeks before the birth, James finds an apartment in Weybridge, Linda bids a tearful farewell to her parents and joins her husband. Homesick on New Year’s Eve, they set off for Glasgow. Disaster strikes and they spend the night in a cell in Carlisle Police Station. Another time they attend a family wedding, but on the return journey they are involved in a nasty accident on the A74. The young couple work hard, endure hardships, suffer injustice but feel their perseverance starting to pay off when they buy a house in Kingston upon Thames, Surrey. Their eyes are opened up by some of the ‘goings on’ in their new street; things, they thought, only happen in films. The hardships and humour of Glasgow folk in this era come into their own in this book.